Maheshinte Prathikaaram malayalam movie to be directed by debutante Dileesh Pothen featuring Fahadh Faasil in lead would start rolling very soon. Scripted by Shyam Pushkaran, the movie set against the backdrops of a village revolves around the life of a still photographer and some incidents which happens later. Shyju Khalid will crank the camera for the love story. After the pre production works, the movie is expected to go on floors at Idukki in the first week of December 2014. The most wanted actor Fahadh Faasil is getting much busy these days. After wrapping up the shooting of his recent venture 'Money Ratnam', Fahadh would take a break and later join the sets of 'Isam' directed by Vinod Sukumaran. But it seems that the filmmakers are not yet ready to leave the young actor. Dileesh Pothen who has an experience working in the industry as associate director for the past 12 years is gearing up to helm his independent project. Titled 'Maheshinte Prathikaram', the movie featuring Fahadh Faasil in lead would pool into the life of a still photographer. Set against the backdrops of a village, the story revolves around the life of a photographer who makes his living by running a small studio. He used to take wedding and other photography assignments to keep his family safe and happy. An event which takes place in his life turns things down. How he handles the situation forms the crux of the movie. Creamed with humour, romance and thrills, the movie would tell about love and revenge. The heroine and the artists doing other significant roles are yet to be decided. 'Maheshinte Prathikaaram' is being produced by filmmaker Aashiq Abu.Penned by Ajayan Challissery, the screenplay is handled by Shyam Pushkar. Bijibal who is known for the excellent works as musician will set the tunes for this thriller. Mahesh who had worked as an associate of Aashiq Abu for long years will use his experience in his independent venture. He is also known for his noted acting in movies life 'Salt N Pepper', '5 Sundarikal' and 'Gangster'. Shyju Khalid will crank the camera for the love story. 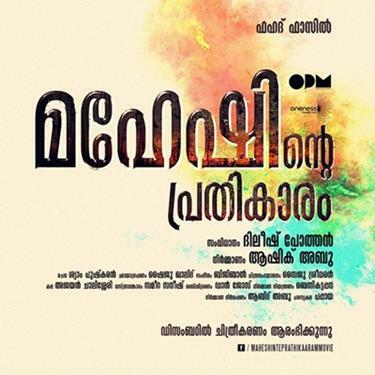 If things go fine, the movie would go on floors at Idukki during the first week of December 2014.